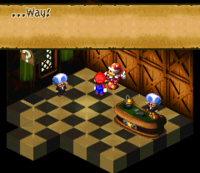 “Look the other way” is the name of a game invented by and played with Grate Guy in Grate Guy's Casino in the game Super Mario RPG: The Legend of the Seven Stars. The game is free when Mario plays it. To play it, Mario must guess which way Grate Guy will look, thus looking the other way. Essentially, the game has 50/50 odds. If Mario wins, he will be usually be rewarded with undesirable prizes such as a Rotten Mush or a Wilt Shroom and a Moldy Mush (although he occasionally receives rare items like Rock Candies, Red Essences, Royal Syrups or Kerokero Colas). However, if Mario wins 100 times, he is rewarded with the Star Egg. Atchimuitehoi A Japanese derivative of Janken. This page was last edited on November 28, 2018, at 09:23.